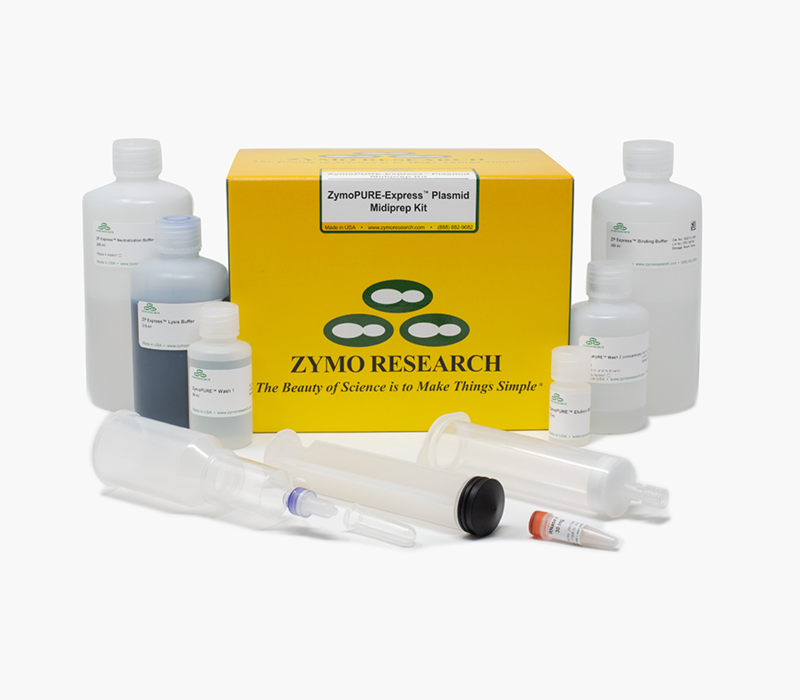 The ZymoPURE - Express Plasmid Midiprep Kit utilizes a patented alkaline lysis method for purifying up to 1.2 mg of high-quality endotoxin-free plasmid DNA directly from the culture without the pelleting and resuspension steps. Just add the ZP Express Lysis Buffer directly to your bacterial culture, neutralize, filter debris, and purify using the patented Zymo-Spin V-P microcentrifuge column. The ZymoPURE - Express Plasmid Midiprep Kit is the fastest and easiest method for isolating plasmid DNA from E. coli. The innovative binding chemistry (patent pending) enables highly concentrated DNA to be eluted directly from microcentrifuge column. The wash regimen has been optimized to ensure the plasmid DNA is free of endotoxins, salt, and protein. The eluted plasmid DNA ideal for transfection, restriction endonuclease digestion, bacterial transformation, PCR amplification, DNA sequencing, and other sensitive downstream applications. As an added convenience, the ZymoPURE - Express Plasmid Midiprep Kit contains patented colored buffers that permit error-free visualization and identification of complete bacterial cell lysis and neutralization and syringe filters are included for rapid lysate clearing. No large centrifuge! No cell pelleting! No gravity filtration! No ethanol precipitation! From culture to endotoxin-free plasmid DNA in 15 minutes!